Between 21st June and 2nd July 2018 we ran our first ever journey for 81 creative and entrepreneurial young people from diverse backgrounds. The participants were 18-26 years old, hungry to learn and motivated to create change. During the journey we visited towns and cities in England, Scotland and Wales, visiting a total of 8 locations. The journey was designed to encourage the young participants to come up with their own entrepreneurial or creative ideas to tackle challenges in their communities. By bringing together people who might not normally meet and taking them to places they might not usually go, we created an intense and unique learning environment. And as we travelled from place to place, we explored the different issues facing UK communities and then looked at different innovative solutions to tackling these with the aim of inspiring the Drivers for Change participants to develop their own ideas. The participants came from all corners of the UK and 18 came from overseas, thanks to the help of the British Council. 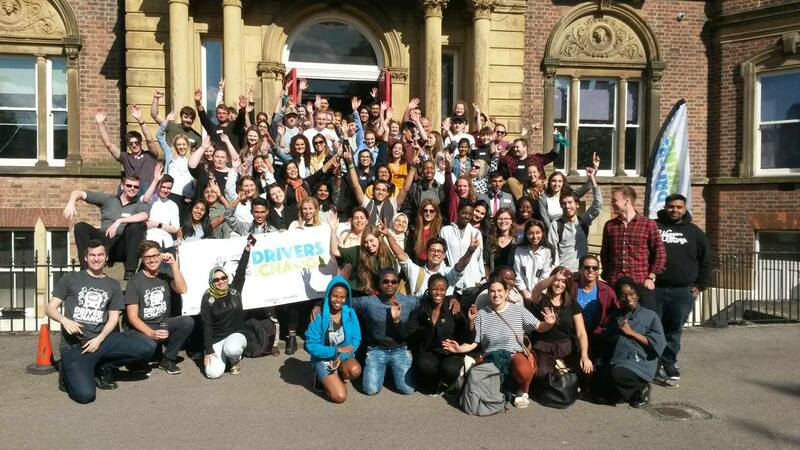 The young global network is now committed to driving change in their communities and we are continuing to work with them to help them turn their ideas into action! We're now planning for our second journey, stay tuned for dates! If you would like to kick-start your own journey to creating change by taking part in a future project, please sign-up here. We'll keep you informed as new opportunities arise! Build connections with people from the UK and overseas who will challenge your perceptions and support you to grow. Explore and be inspired by innovative approaches to social change that are already having an impact around the UK. Gain a greater understanding and make a plan of action for how you can create social impact in your own community. What is your application criteria? Enthusiastic and passionate young people with demonstrable experience of social action (examples of social action include: fundraising, volunteering and campaigning. This could be via school, college, uni, a charity or community/faith group). Our aim is to represent the full breadth of society in the groups we work with. This means we want to include people from all backgrounds and of all abilities. Part of the value of the experience is spending time with people you might not normally meet, so it's important to us that you are open-minded to socialise with and build relationships with people from a different background to yourself. We are committed to making every possible adjustment to make our programme accessible, if you have a question about accessibility please email Leonie@driversforchange.org.uk. This is a unique experience and what each participant will get out will depend on what they put in. We ask everyone to come with an eagerness to learn from their peers and a willingness to participate enthusiastically in all elements of the journey and to engage with the network beyond its end - this is vital for getting maximum value from the experience. Build their network and create connections with like-minded creative and entrepreneurial people from different backgrounds. Receive practical advice on how to develop a social enterprise, business or arts project. Be inspired by and connected to social leaders from across the UK. Get ongoing access to a peer skills exchange. Receive access and signposting to seed funding opportunities. Get support to promote a social enterprise, business or project. Develop an understanding of a diverse range of social challenges around the UK. Meet social entrepreneurs from countries including Indonesia, Pakistan and Brazil and learn about the social challenges in those communities. This year we partnered with the British Council’s DICE (Developing Inclusive and Creative Economies) programme which is running in Egypt, Brazil, Pakistan, Indonesia and South Africa. We are excited to have had 18 participants from the 5 countries attend our first journey and hope we can extend our reach in further years. Would you like to help make Drivers for Change a success? We're looking for funders, speakers and facilitators for future projects. Get in touch if you'd like to find out more about how you can help.